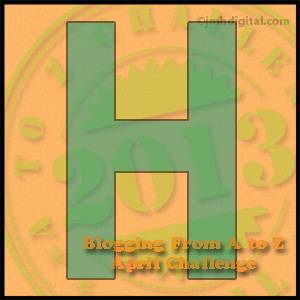 H is for Handicrafts. From a young age, my mother taught my brothers and me never to be bored. Bored meant she would find us something to do. You know moms — any activity they find to keep you busy is nothing you want to do. Fast forward a few years and the lessons learned from childhood are still with me. I don’t like being bored. In fact, I always have something to do. I might not want to do it, but I do have something that needs to be (or could be) done. But not just anything, mind you. The thing taking up my time has to have some purpose besides just being there, has to require some amount of skill to engage me. I love Legos and Nanoblocks, but those things get expensive. Recently I discovered Metal Earth kits — models of ships, buildings and such made of paper thin, laser cut metal. I’ve already put together Big Ben. My hubby is waiting for me to do Space Shuttle Atlantis so he can put it on his desk. I started fiddling with chain mail weaving a few years ago and make random things (bracelets, necklaces, key chains) when the mood strikes me. I have an inkle loom I haven’t used in years that I need to get back to. I bought it because my middle school teacher got me interested in weaving. I can’t knit or crochet to save my life (it’s either too loose or too tight and I tend to lose count of my stitches) but I love weaving — thread and metal. I started and stopped 3D origami. The paper triangles I made were too small for the piece I wanted to create. Since getting the triangles ready is a little time-consuming (yes, I know that’s the point), I haven’t picked it up again. I plan to, just not right now. Just a few days ago, I got interested in rolled paper art. It’s a wonderful way to recycle old magazines and paper and turn them into something useful. As soon as I get to the craft store to get the glue/glaze I need, I’ll be turning my junk mail into bowls, decorative mirrors, and beaded bracelets.